Chaise is perfect for relaxing, and has a unique style with hidden storage under the seat. Constructed of hardwood frame with black finish microfiber fabric padded with polyurethane foam. 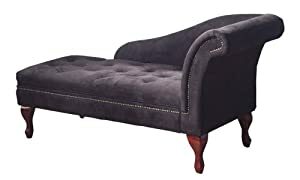 Chaise measures 63-inch L by 25-1/2-inch W by 31-inch H. Some assembly required. Hidden Storage Dimensions: 46 inches long x 20.25 inches wide x 4 inches high, Seat Dimensions: 49 inches long x 21 inches deep, Seat Height: 18 inches high.